A composite card (comp card) is essentially a business card for models. It is an A5 size card that is printed with your photos, measurements and contact details.The front is generally printed with your main image- usually a great headshot, your agency name and your name. The back is then printed with 1-4 other smaller images, your measurement details and your agencies contact details. Different agencies may have different layouts and sometimes you will get special comp cards for occasions like fashion week. 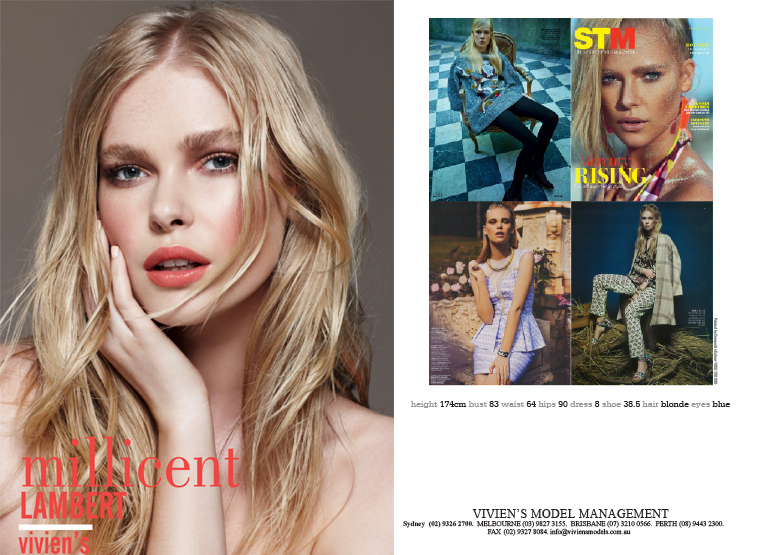 A comp card is a must have in your bag for all your castings and go see's . As with a business card it is a professional gesture and a key tool for securing bookings and enabling clients to remember you. I keep my comp cards in the front pocket of my iPad case and portfolio for clients to easily see and take a copy whilst perusing my book. If they have not taken a copy by the time they return my book I will usually hand them a copy myself for their reference. It can be surprising how many you give out in a busy day, so it is best to always have a big stash both in your handbag and at home to refill your stock. My agency (Viviens) always have copies of my comp cards on display in their offices, along with the comp cards of their other models. If I need to re-stock my supply I will simply grab a few from Viviens (although always taking care to let them know if I am running low and to leave sufficient copies there for walk-in clients). A comp card is not something that you need to organise yourself (unless you are freelance). Your agency will design and print them off for you and simply charge the price of the printing to your account. Your agency will likely update your comp card as soon as you get a great new headshot, when you run out of cards or annually to keep it looking fresh and new. Comp cards will usually be printed when needed and the fees will be charged on to your account. Full colour comp cards are printed in lots of about 50 cards. The cost will vary depending on your agency and market. The size or layout of your comp cards can vary between agencies and countries. Some countries will even just have a full page of paper from the printer with some photos and details on them. I hope this post was helpful? Let me know in the comment section!